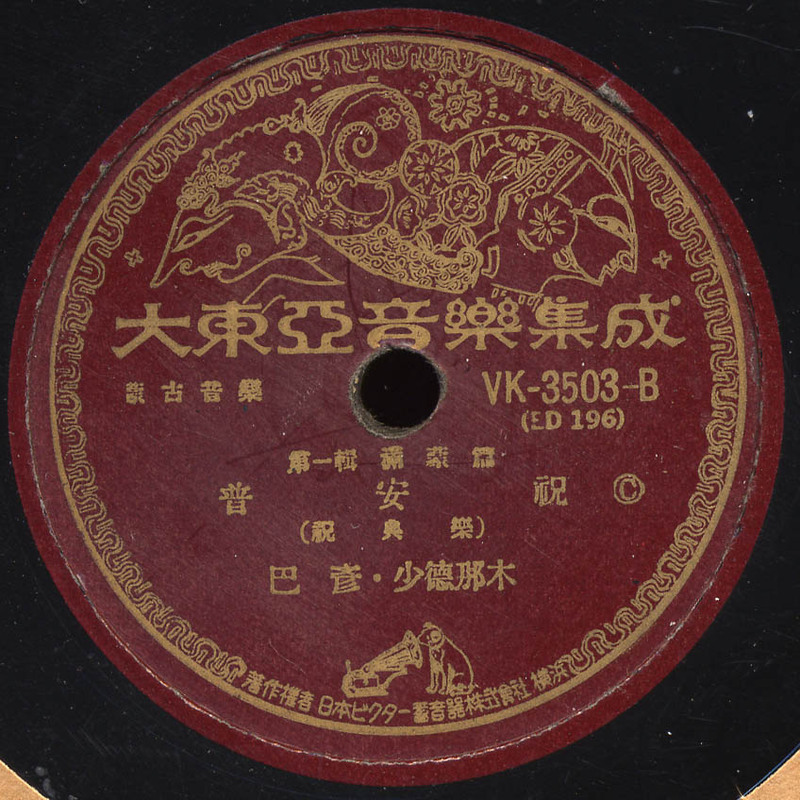 I’ve posted 27 Chinese records so far, representing most recorded styles of Chinese Opera and the majority of pre-WWII record labels (as well as a few odds and ends thrown in!) and now it’s time for a vacation. No, Dear Reader, I’m not taking a break from posting records, but instead embarking on a whirlwind musical tour of Asia and southeast Asia …first stop Inner Mongolia! I picked up this record in a batch of 50+ Chinese and Japanese records. When I saw this strange label I knew I was onto something. My first guess was that it was Korean, even though the writing was in Japanese. Wrong! It turns out that this was part of a set called “The Ultimate Collection of Great East-Asian Empire’s Music” and was put out by Victor Japan, most likely in the late 1930s. It seems to have been something of a propaganda piece as Japan was trying to promote the idea that all the areas under it’s control (Inner Mongolia, Manchuria, Taiwan, Korea, and others) were part of one great “East Asian” Empire. If anyone has further information on this set, please contact me! The B side lists the song name as “Mongolian Royal Festival Music” performed by Fa-Un and Shao-Tao-Nah-Mu (approximate pronunciation) and features the Mongolian hammered dulcimer called yoochin (or yoochun), a version of the Chinese yangqin and what sound likes a kuuchir (aka sihu), essentially a 4 stringed erhu. The A side is available on the amazing Secret Museum of Mankind: Central Asia listed as Mon-Gu Tuul 1, my source transaltes it as The Song of Genghis Khan’s Horse. This label seems familiar, I think I have some records in storage somewhere. I can try looking for them.